The Angriest: Star Trek: Voyager: "Threshold"
It is 29 January 1996, and time for another episode of Star Trek: Voyager. Lt Paris (Robert Duncan McNeill) becomes the first person to ever fly past the 'transwarp barrier', the point where a vehicle is travelling so fast that it simultaneously occupies every point in the universe. 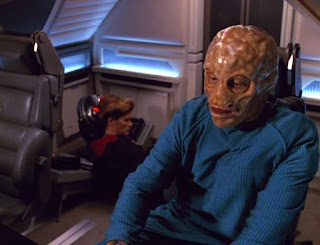 Once back on Voyager, however, he begins to suffer a massive cellular change - and if the Doctor (Robert Picardo) cannot arrest the development, it may wind up killing him. Every Star Trek series tends to wind up with one episode that is so widely derided by fans that it gains its own perverse kind of mystique. For fans of the original 1960s series, there is "Spock's Brain": aliens steal Spock's brain from his body, forcing Dr McCoy to control his movements with a remote control deck. In The Next Generation there is "Sub Rosa": Dr Crusher has a torrid sexual affair with a glowing alien ghost on a colony based on 18th century Scotland. For Voyager there is "Threshold", otherwise known as 'that one where Paris and Janeway turn into giant lizards that have babies'. Here's the thing: "Threshold" actually begins really well. There is a wonderful sense of camaraderie among the regular cast. Paris, Kim (Garrett Wang) and Torres (Roxann Dawson) bounce off one another brilliantly as their transwarp experiment is developed. It's the first time I've noticed just how young these characters are, as they all exude this youthful exuberance and enthusiasm. The dialogue is realistic but playful, the characters have energy and personality, and it all has a utopian, upbeat shine to it. When Paris finally undertakes the real-life test, breaks the barrier and has a transcendent experience outside of normal reality, it honestly feels like peak Star Trek. Then he begins to experience rapidly deteriorating health effects and mutates into a sort of space newt. It's enough to give you whiplash. I cannot think of another Star Trek episode that goes from brilliant to actively awful in such a sudden sequence of events. To his credit Robert Duncan McNeill does some superb acting - the best I've seen him done - while trying to sell the idea that Paris is evolving into a paranoid and mentally unstable lizard. By the time he breaks his restraints, kidnaps Janeway and shoots off in a Warp 10 shuttlecraft, any hope of the episode ending in a convincing fashion are lost. At warp 10 one exists simultaneously in every point in the universe, and yet when lizard Paris takes off, he only goes a few light years away - convenient. Once an away team locates him and Janeway they've both evolved into giant salamanders with a growing clutch of babies. It's jaw-droppingly bizarre and weirdly awkward, and it's no surprise that the episode skips over however both characters were restored to their human forms. We also never hear of this warp 10 research project again, which seems unlikely. It ends on a notoriously stupid note, but it's actually an entertaining kind of stupidity because it really deserves to be seen in all of its weird, ludicrously awful glory. The first half of the episode is genuinely great. I may be the first person to claim this, but "Threshold" is ultimately not that bad. It's certainly very watchable in its own perverse fashion, and on some level you have to applaud the boldness of it all. This is the ninth enjoyable episode out of 15 this season, bringing the quality ratio up to 60 per cent. I'm as surprised you are.